Fishing Monthly always loves the opportunity to compare boats designed for similar uses. 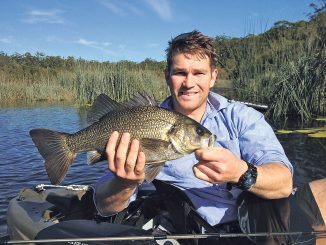 If you are after a boating package to fish your local estuary, our inland lakes and rivers, it is well worth checking out the Stacer 399 Proline and the Stacer 429 Proline Angler. Testing boats for the magazines can at times be hard work. Poor weather can affect our ability to get a feel for how a boat performs, time limitations also prevent us from really testing things like the fishability of a boat and use it in the way you would expect to use it if it where your own. So, when the opportunity comes up to not only have an extended period of time using a boat, but to also compare two boats that are designed with similar styles of fishing in mind, you jump at that chance. 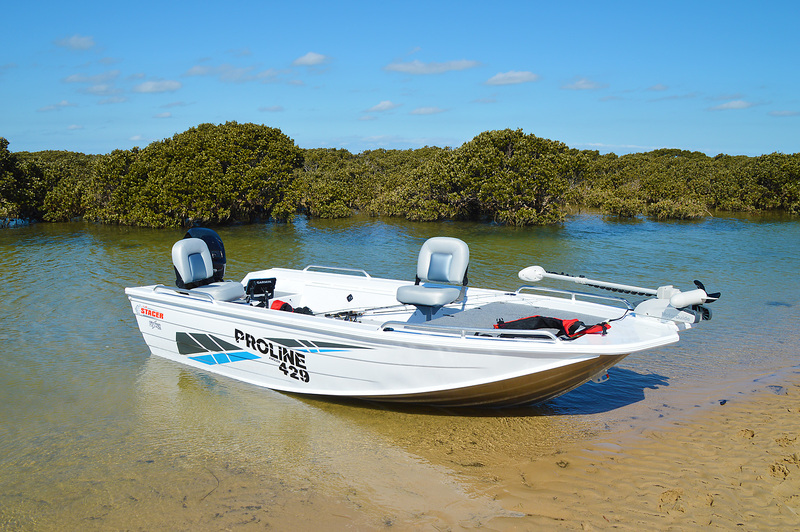 This was the case when Andrew Stephen from Melbourne Marine Centre contacted me about testing a Stacer 429 Proline Angler and a Stacer 399 Proline at Venus Bay over a weekend. 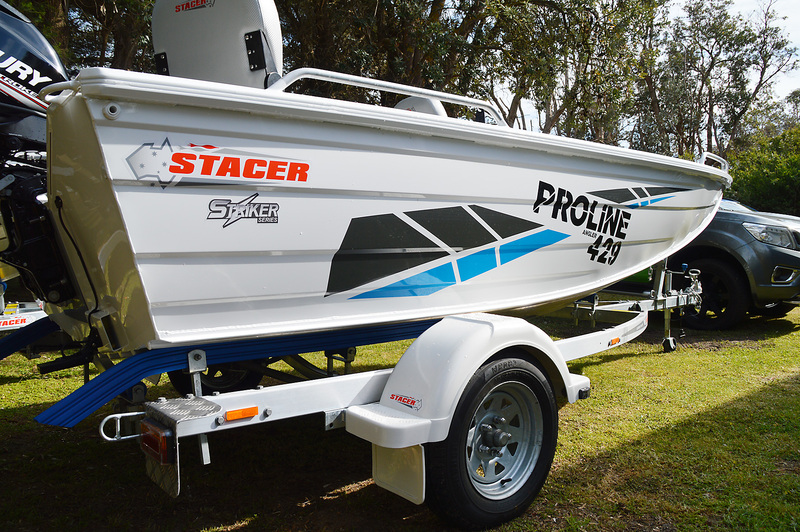 The 429 Proline Angler and the 399 Proline are part of the Stacer stable of boats built using the Striker Series hull. I will go more into the performance of the hulls separately, however, the biggest difference I could see in the hull configuration itself was that the Proline Angler had a bit more V through to the transom to divert/cut water away from the hull, whereas the Proline had a much flatter profile. Both are designed to be stable underway and at rest, and that makes them very suitable for casting lures from (which was our intention over the weekend). 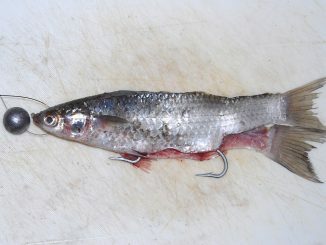 But it also means the vessel is very comfortable if you wish to bait fish or troll. 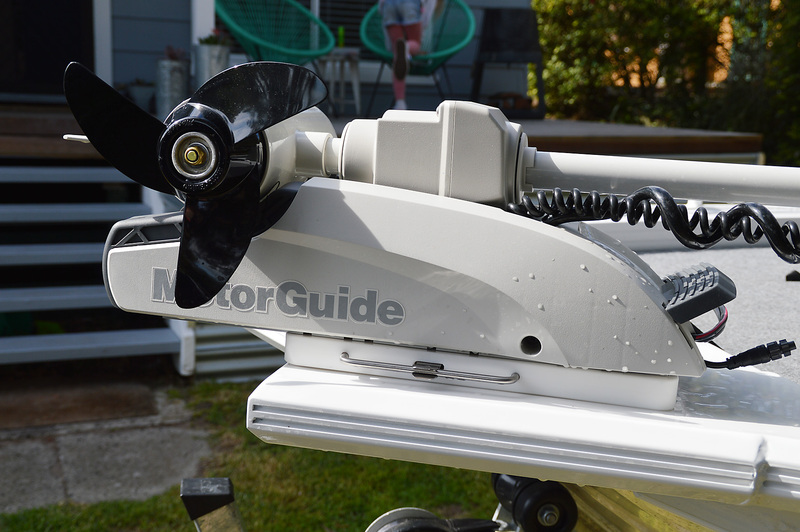 With the lure casting in mind, Andrew has optioned both with a Motorguide Xi3 55lb trust electric motor. Other than the overall length, the biggest difference between the boats is above the hull storage wise. 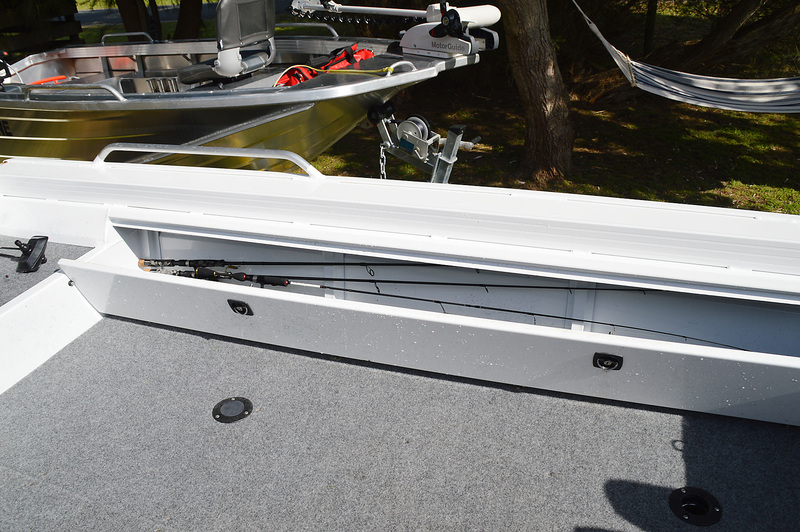 The Angler has more storage space and options within the casting deck at the front. 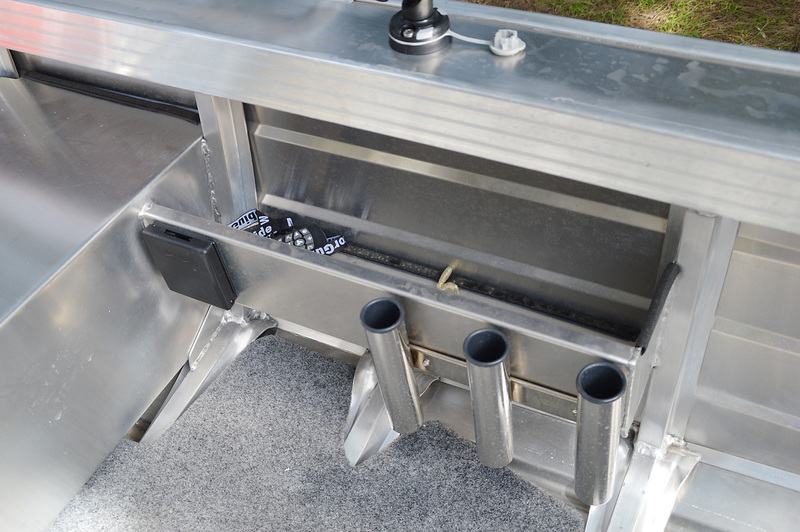 The Angler tested had a plumbed livewell installed, as an example. The Angler is also has a significantly heavier (hull weight) than the standard Proline. Motor wise both boats were fitted with Mercury 4-stroke outboards, the Angler with a 30hp and the Proline with a 20hp. Both packages came on a Stacer Alloy Light trailer and could be towed by your average family vehicle. These packages are matched to trailers in the factory, so they towed with no fuss at all. Although the boat ramp at Venus Bay is a good one, at low tide it has its challenges and it was good to know that even in very low water both boats were simple to launch and retrieve and could easily be done by one person if need be. The 399 Proline had plenty of fishing mojo. Andrew caught some solid fish too. To be able to spend a couple days using the boats as you would your own was a great opportunity. Here the author is putting the final touches on a silver trevally he caught from the 429 Proline Angler. 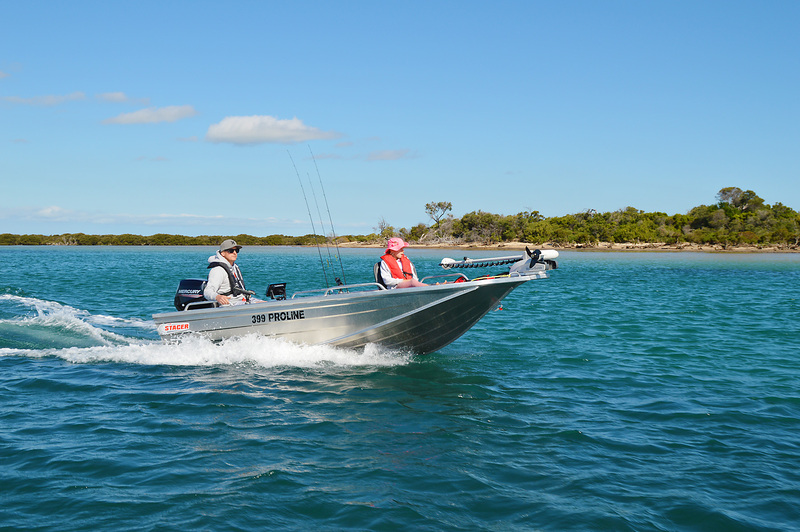 The Mercury 20hp 4-stroke and Stacer 399 Proline was a great match – a simple boating package that will provide hours of enjoyment on the water. Both boats were set up with simplicity in mind. The addition of an electric motor, a quality sounder and some thought put into the layout and you have two great fishing and boating packages. Once on the plane the Stacer 429 Proline Angler matched with a Mercury 30hp 4-stroke handled beautifully. It was a pleasure to be in, as we explored what Venus Bay had to offer. Mia Stephen was keen to come out with us and catch a few fish while we tested the boats. She spent most of her time in the 399 Proline, showing dad how it is done. 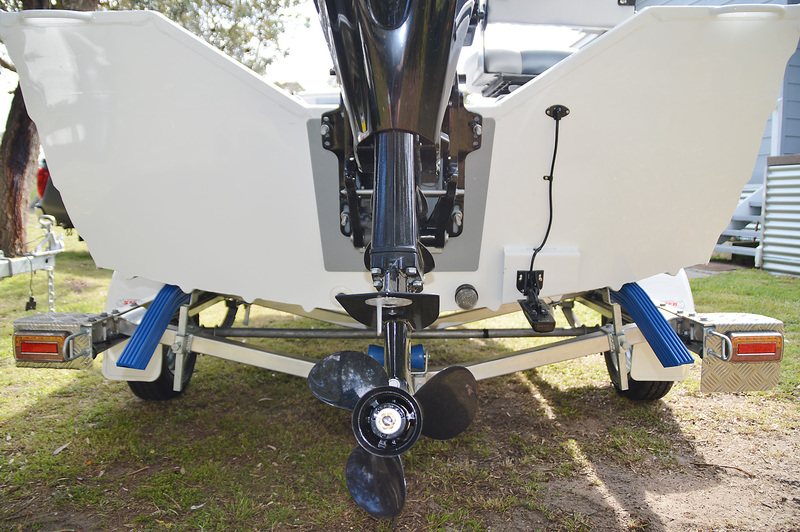 Both packages use the Stacer Striker series hull. The Proline Angler hull had a bit more V to improve water deflection and deal with the extra weight of the hull. 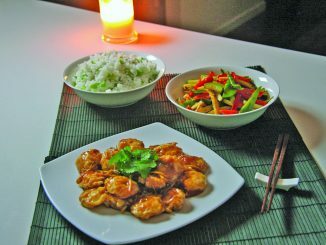 The wider chines provide great stability at rest and underway. Although a feature of the 429 Angler is the additional storage, with the extra space a full front casting deck provides, both boats have purpose built storage. 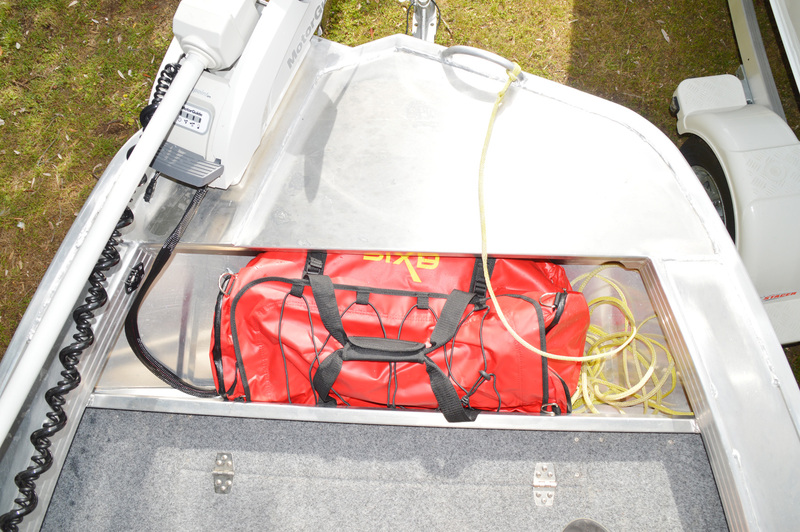 The 399 has small pockets in the gunnel as well as an area at the bow for larger items. 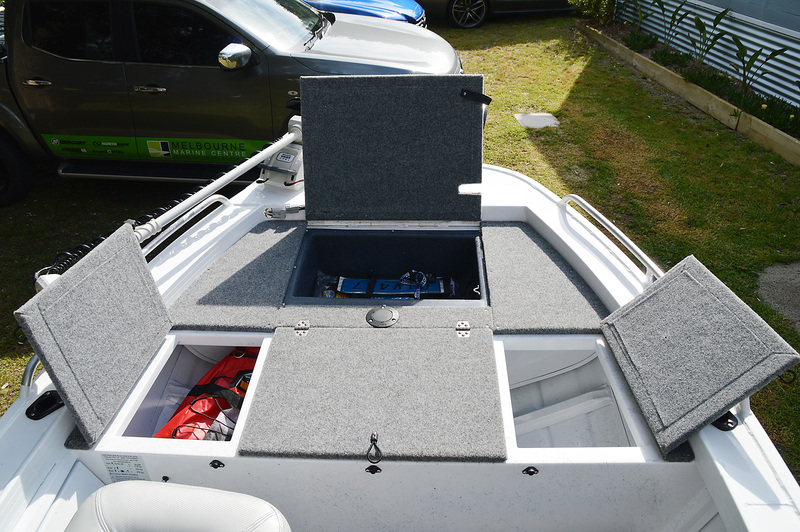 In addition to front deck storage, the Angler has very clever storage hatches near the transom and the test boat was also fitted with a deluxe rod locker. Overall, both have enough storage to keep things out from under your feet. I have to say I was a little surprised at how different the boats performed on the water as far as ride and handling was concerned. It goes to show how much weight affects performance of a hull and also how much even a small V changes what the hull has to do to get on the plane. 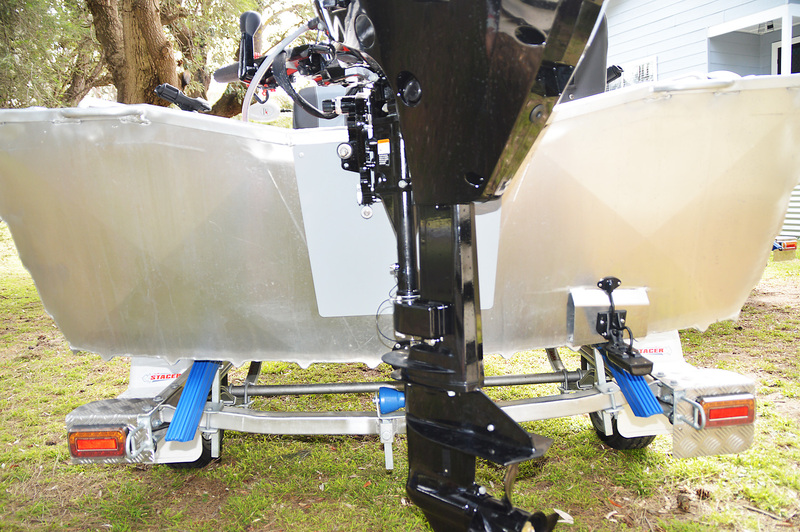 The 429 Angler is rated to a 40hp motor with the test boat packaged with a 30hp on the back. With the extra length and weight of the boat, the 30hp was a little sluggish to get on the plane with two people onboard (some of that may have been to do with this rather large author), but once there it was excellent. We were unable to get performance figures, but a boat like this isn’t about getting from A to B in a hurry, more importantly it has to handle well and maneuverer easily at low and high speed. This it did, beautifully. 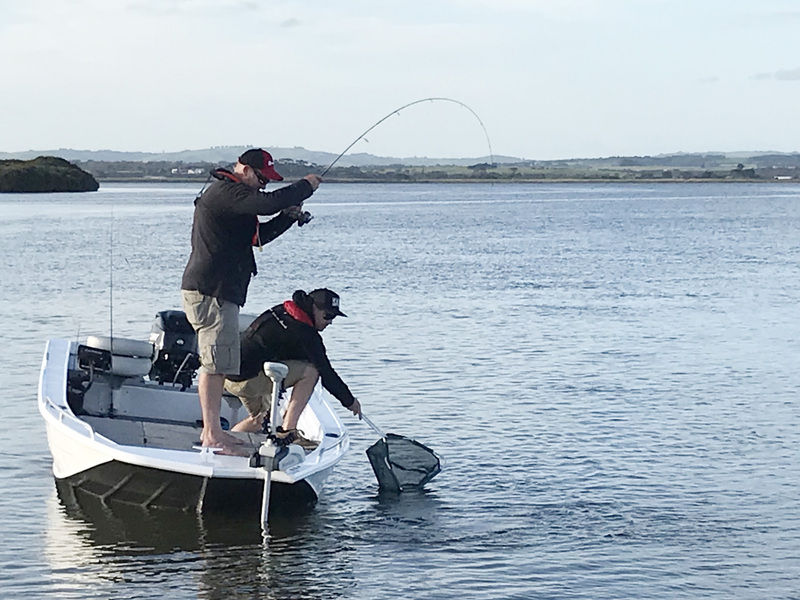 The package doesn’t draw a great deal of water, which was a godsend at low tide at Venus Bay and this also gave us the ability to sneak up a few little tidal creeks that see very little fishing pressure, which was a real eye opener for this Queensland angler. Stability underway and at rest are also vital components of smaller boats and the Angler version is rock solid in this department. The 399 has a maximum horsepower rating of 30hp, so my expectation of the test boat was similar to the 429 Angler, that it would take a little time to get on the plane with the 20hp Mercury it was packaged with. I was wrong – the lighter and flatter hull meant that the 399 transitioned onto the plane comfortably and, like the 429, handled well at low and high speeds. It too was very comfortable in shallow conditions and was even more suited to the low tide exploring we did at Venus Bay. Andrew installed a casting platform and a low profile floor in the 399 to assist angler stability at rest, which made it great to cast lures from. It was also very stable underway. Simple and effective storage is provided in the 399 Proline. The Mercury 4-stroke range is known to be frugal on their fuel usage. Reliable and fuel efficient, what more can you ask for? 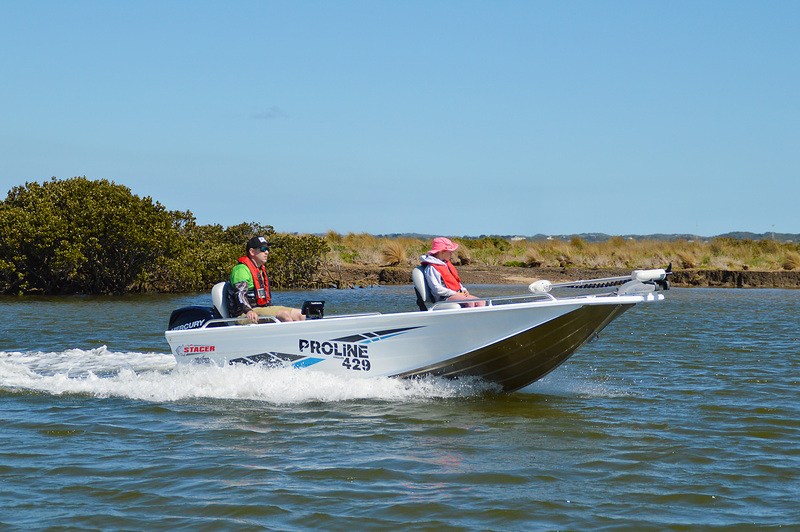 The Motorguide Xi3 electric motors that were on both boats provided the stealth and manoeuvrability to fish the mangrove lined system at Venus Bay. Just hit anchor lock and stay where the fish are when you find them. One of the biggest differences between the two packages is the storage that the Proline Angler offers. Lots of storage keeps the decks clears and provides more room to fish. Both boats were on a Stacer Alloy Light trailer. They are matched by the factory, ensuring they tow well and make launching and retrieving a breeze. 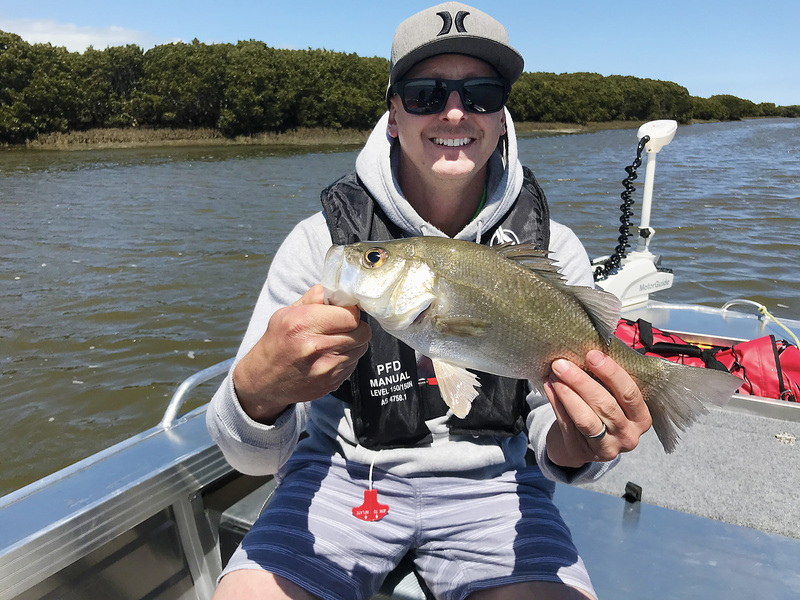 Although we spent plenty of time motoring around putting both boats through their paces, we also allowed plenty of time to take in the fishing that Venus Bay has to offer, especially the estuary perch fishing. A key component of this was accessing the waterway at low tide and fishing the mangrove lined edges and channels as the tide pushed in. As mentioned, this was a key feature of both boats. Andrew has shown us in past tests we have done with him that he likes to purpose fitout his boat packages and this was once again the case, as the addition of the Motorguide Xi3 on both boats meant we could stealthily position ourselves to cast our soft plastics and use it as an anchor (anchor lock) when fish were found. 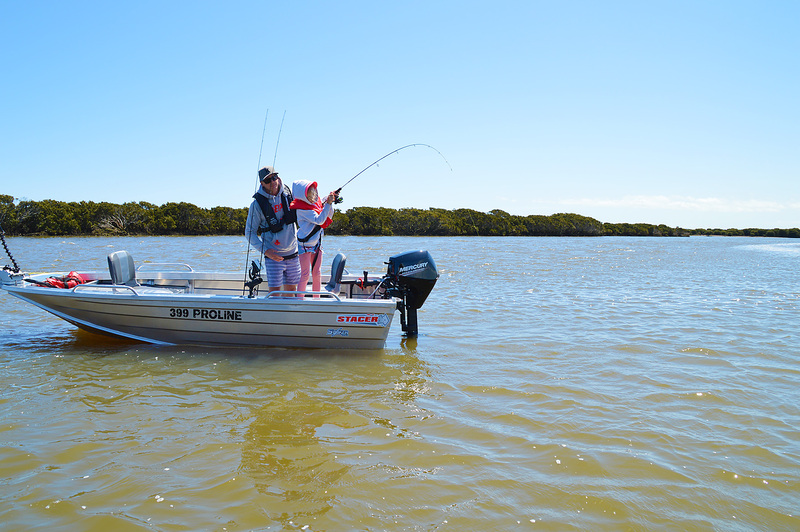 Both boats have excellent stability at rest, even when anglers fish from the same areas of the boat. It was interesting to see photos of the boat when both anglers were together. It shows the boat leaning, but you didn’t notice this while on board. We did not fish three out of either boat, but I believe you could do it in the larger 429 comfortably. In the 399 it may be a tight squeeze. 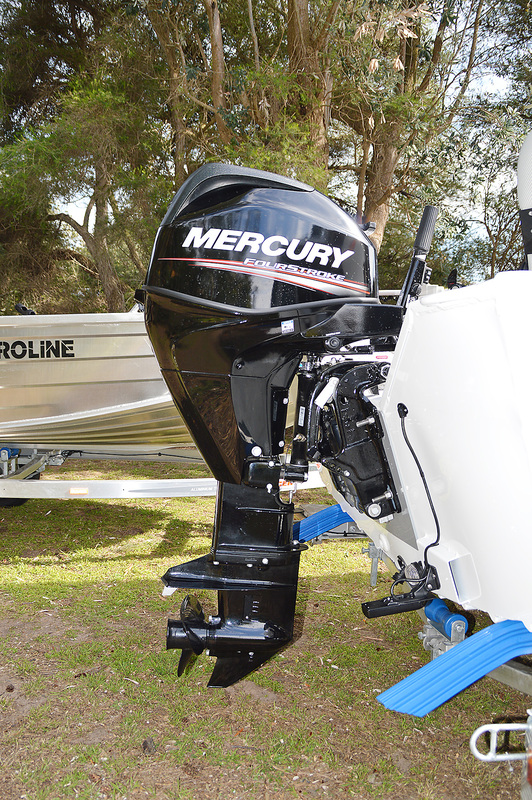 Although we did not have fuel usage figures, Mercury outboards are known for being frugal on fuel and this proved to be the case. The boats started with full tanks and after two days running around there was more than half a tank left in both. How does this improve fishability, I hear you ask? You can fish for longer and it is more affordable. I have had a bit of time since doing these tests to think about summing up what each has to offer and which I would buy for myself to go and do the types of fishing we did at Venus Bay. Is it as simple as bigger is better? No, it’s not. 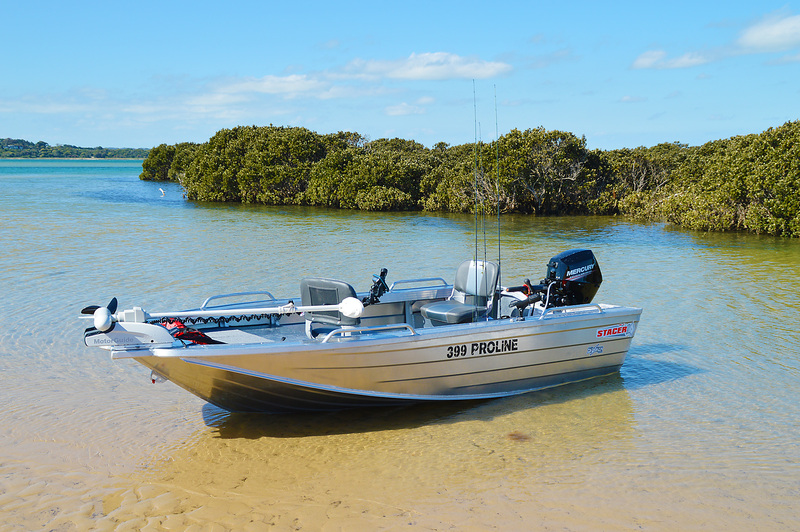 Both boats tick the key boxes when it comes to having a package that will allow you to fish with lures in areas like Venus Bay, or any of our estuary systems, and would be well and truly at home on our inland waterways or rivers like the Murray. I like the additional storage the 429 Angler has, as it allows you to have a few extra outfits onboard, but I also like the simplicity the 399 offers. 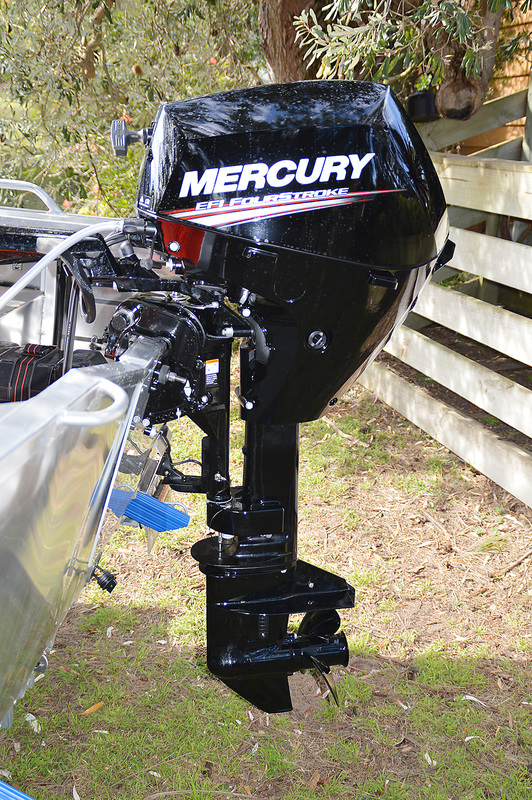 I was very impressed by how the 399 and the 20hp Mercury outboard matched up. It was a great little setup, with a tested price of $17,431. That is very affordable and I don’t believe I would change too much. I have very similar thoughts on the 429 Angler, but I would put the maximum horsepower on the transom. On those days when you have three or four onboard you would appreciate it and it would be a bit more aggressive onto the plane, which I prefer. Doing this adds a little over $3000 dollars to the $23,750 as tested price. 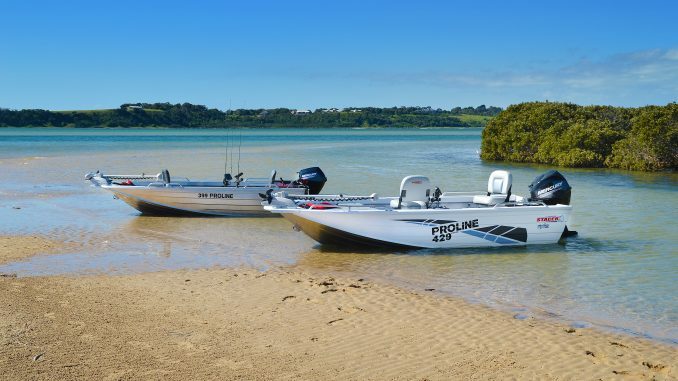 Although marketed as entry-level packages, there is a lot of value in what the Stacer 399 Proline and the 429 Proline Angler have to offer and they are well worth a look. You can contact Andrew and the team at Melbourne Marine Centre on 03 9703 2003 or check out their Stacer packages at www.melbournemarine.com.au.